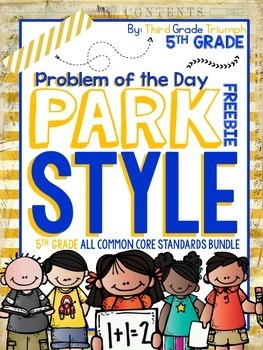 PARCC - PARCC- PARCC- The PARCC is near, but never fear the PARCC ("PARK")Math bundle pack is here! This pack includes PARCC problem types for ALL 5th grade math Common Core Standards! Since most states are reforming their state testing to the PARCC test, there is such a shortage of quality materials that will help students practice and become familiar with the language and types of questions used on the PARCC. This pack was designed to meet that purpose and expose 5th grade students to the rigor and complexity of the PARCC assessment. This pack will give a quick analysis of the types of questions found on the math PARCC assessment and gives ample practice problems for students to get used to the question format. I hope you find this product useful and informative! This problems in this product are outlined as problem of the day questions, which is a great format to engage the class or small groups in discussions about how they got their answer, how they justified their answer, and why certain answers aren't correct; however, you can use this product as homework, do now, in small groups, as center pages, or even as quick formative assessments of students understanding, application, and justification of their knowledge and concepts they've learned. This FREEBIE only contains a small sample of the questions from the bundle pack.